At one time ferries connected millions of British holidaymaker's with a host of European countries, but as former ferry hub Newcastle is forced to sever its historic links with Scandinavia, are we finally waving farewell to the UK ferry industry? Until recently ferries were responsible for connecting UK islanders with many of their European neighbours – Ireland, Denmark, Germany, France, Belgium, the Netherlands, Spain, Sweden and Norway. But as the UK ferry industry struggles with ailing health, such links with the mainland are fast disappearing; 2005 saw the closure of the Harwich – Cuxhaven ferry route, the last such remaining link with Germany, and 2008 saw Scotland’s final ferry link with the Europe mainland disappear for good. Over the last decade the once vibrant shipping hub of Newcastle-upon-Tyne has been forced to sever its North Sea ferry links one by one. 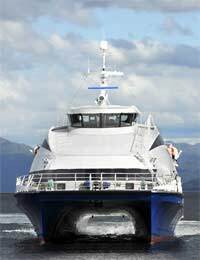 2008 saw the final ship sail eastwards to Scandinavia, when the Bergen, Norway ferry left port on September 1st. At one time you could sail from Newcastle to Oslo, Haugesund, Kristiansand, Gotherburg, Hamburg, Esbjerg, Ijmuiden as well as Bergen. Now the only ferry route remaining is that to Amsterdam, and even the future of that remains in doubt. Although the southern part of the UK may have benefited hugely from the superb Eurostar connection – particularly with the opening of the high speed rail link from London St Pancras in 2007 – it seems Scotland and the north of England are more becoming more adrift from the continent than ever. The popularity of low-cost airlines, rising fuel prices, the end of duty-free sales and the opening of the Channel Tunnel have each done their bit to give the UK ferry industry a serious battering. Countless route closures, massive job cuts; the effects have been a regular news item for over a decade. Serious problems for the ferry companies began in 1994 with the opening of the Channel Tunnel, and were further compounded by firstly the axing of duty free sales in the late 90s, and then, perhaps more significantly, the rise of budget airlines. Suddenly more holidaymakers were opting for a speedy flight to a Spanish beach resort over leisurely ferrying their caravan across to French pastures. The slow roll of the ferry is perhaps just too impractical in the hurried mindset of the modern world. Unfortunately so much is lost with this modern predilection for jetting blindly into a foreign destination; the human sense of distance travelled, the adventure of journeying across foreign lands and also the slow relaxing pleasures of travel. Flying is a chore that bookends the period of fun and relaxation, whereas a ferry journey is an important part of the holiday itself. Arriving in a city by water has been the natural route of travellers for centuries – whether it’s down the Elbe to Hamburg or up the fjord to Bergen – watching your destination slowly approaching over the horizon certainly beats being dumped unceremoniously in its airport in the outskirts. Whether it’s the white cliffs of Dover, or the Statue of Liberty, a lot of national symbols are emblematic because they are the first things that capture the eyes of immigrants arriving into the country by sea. The first thing first time visitors to England are now likely to see is the soulless sprawl of Heathrow airport. However, it is misleading to conclude that cheap flights are effectively superseding the dying ferry, as if it is a natural stage in the evolution of transport. The budget airline phenomenon may have stolen business away from the ferry industry in recent years but it has not replaced it. Rising fuel prices and increasing concern for environmental impact of air travel is expected to curtail the current penchant for cheap flights, and apart from the Channel Tunnel the only alternative for the average UK traveller will likely be the humble ferry. But with these links slowly disappearing, there may not be many places left to sail to. If the UK ferry network does survive then sea travel may well once again become a viable option for many British travellers heading overseas. Although prices have been decreasing in an effort to compete with flights and the Channel Tunnel, ferry travel might still seem pricey in comparison to a seat on an aircraft. However, if you are able to book in advance, are flexible on dates and can shop around then there are some great bargains to be snapped up.